Am I The Last Person Reading Newspapers? On the weekends, i like to go down to the Starbucks in the town where i live early in the morning. About 6:30-7:00am. I like to get there before it gets to crowded, with the peolple ordering these drinks that take 5 to 8 minutes to make. As for me, i just order an earl grey tea. 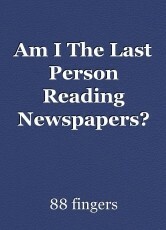 But, i also have a newspaper with me. I mostly get the New York Daily News. With the cafe filling up with people, as they sit down, i see them with their laptops, or ipads or phones and start to read or to do work. I myself will get on my phone to read from other news sources, BBC, Washington Post, NY Times, etc. I like to read the same story from different news outlets to get all sides of a story. But, i very rarely see anyone with a newspaper in their hands. The occasional book, or school text book yes, but i'm alone with the reading of a device that has been around for many centuries.But now, it seems, that with more and more people getting their information at the touch of a fingertip, i'm living in the past. Yes, i do go on my devices to read and to learn, but there is still something to have a paper, or book for that matter in your hands. The feel of the paper, has that soft feel to it. The sound the paper makes when you turn the pages. Even the smell of the paper and the ink, you know that it was humans who had to put this together to get it out to the masses. Laptops and the such feel so impersonal, so cold. Even now, you the reader who is reading this off of a laptop or phone, and you might be in a Starbucks, or another cafe, with all the others around you doing the same. If you are in a cafe, stick your head up, and look around and see if there is anyone who is reading a paper or book? Technology is a great thing,, and progress is what mankind, and womankind, (don't want to forget the ladies) needs to advance society, but in the information highway, sometimes i like to take a leisurely drive on a two lane road in the country, in other words, a newspaper. need help finding a title!